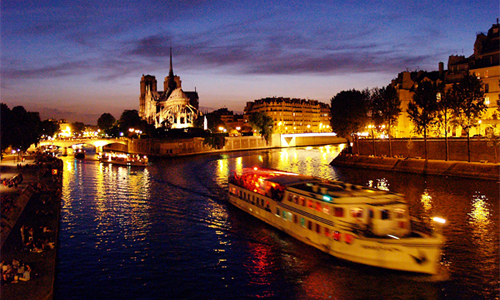 The Seine after dark. I thought I was going out for a quiet stroll along the river, the energy of the day having yielded to the serenity of the night. I was wrong. I discover this after my wife falls asleep early one evening following a long, taxing day of shopping, leaving me with a choice between French TV and a solitary walk along the Seine. Our hotel being just five minutes from the river, I choose the walk. Starting at Notre Dame Cathedral and working my way east, I encounter more people picnicking and partying than I’d ever seen on a southern California beach after sundown. It’s just past ten on a Sunday, when most people back home are ruing the start of another work week. 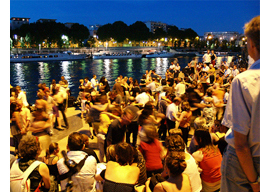 But here, in Paris on the banks of the Seine, it appears things are just getting started. A polyglot of languages from Asia and Africa as well as other parts of Europe and the West tell me these folks aren’t all local. While some spread blankets over the occasional islands of grass that now and then interrupt the concrete and cobblestone embankment, others sit on benches or dangle legs over the river’s edge, a bottle of wine within easy reach. Easy-going joggers and cyclists weave past as I stop to listen to a man playing accordion. It’s a nostalgic old-fashioned love song in the musette style, the dulcet-toned vibrato that flourished in France through WWII. I drop a euro into his tin. It may be a cliché, but musette is what I expect to hear while strolling through this city. The clichés end there. A half mile downriver, just past Pont de Sully, several hundred people converge on a public square at the foot of the Institut du Monde Arabe. No musette here. These people have been drawn by the contagious rhythms of amplified salsa. If they aren’t dancing, they look like they are. Farther along, I encounter even more music: first, a battle of break dancers, then a tango party, each luring crowds drawn as much by the beat as the dancers. I consider stopping for a beer and a bite aboard one of the boats-turned-bars and brasseries moored permanently to the quay. 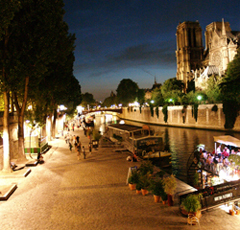 The Six Huit and the Kiosque Flottant I are a stone’s throw from each other on the bank opposite Notre Dame. Turning back, I get a whole new perspective on the river. Anyone who has been to Paris in July will remember how long it takes for darkness to fall. At 48° 51′ north latitude, the sun doesn’t set until almost 10 p.m. Even afterwards, the western horizon continues to glow purple as the day struggles to hold back time. But now true night has fallen, and everything intensifies. Lights from excursion boats and a hundred other sources shimmer and dance across the water … luminescent landmarks strike poses far more dramatic than daylight permits … inhibitions melt … couples embrace. On reaching Notre Dame, I can’t help but notice yet another crowd in the cathedral’s own backyard. Crossing Pont au Double, I step onto the Ile de la Cité, the island where Paris was born. To my right, there’s an artist sketching portraits; to my left, a magician demonstrating sleight of hand. 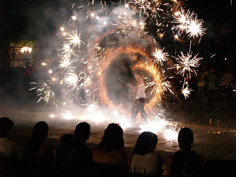 But the real spectacle is just beyond: two guys twirling and tossing burning torches through the air, then catching and twirling them again—up, over and around themselves at speeds so fast it looks as if they are drawing circles of light on a blackboard of night air. Spectators, hundreds of them, applaud. And just when you think you’ve seen it all, out come the fireworks, a pyrotechnic display that lures you back like a bug to light. As the sparks fade, however, the tourist in me emerges. I remember suddenly where I am: alone, well past midnight, in a sea of strangers, blithely engrossed in the moment, a perfect target for a pickpocket. I feel my back pocket, just to be sure. But I needn’t have worried. Everything is in order; the evening concludes unmarred — another exhilarating night in Paris.